Modesto Manager Pete Whisenant saw potential in Robert Moore, just not as a starter. His hunch quickly paid off, with Moore taking two quick wins in relief in June 1982. "I saw him this spring, liked him, and thought he could be a hell of a reliever," Whisenant told The Modesto Bee that June. "He was starting up in Madison. I wanted to make him a reliever. I think he could be awesome coming out of the bullpen in the second half." Moore was already in his seventh season as a professional. Used mostly as a starter, he'd only made it as high as AA twice. After Whisenant's switch, Moore soon left single-A for good, he also made the majors. Moore's career began in 1976, drafted by the Athletics in the 11th round out of high school. He started that year at short-season Boise. That first season he pitched that year mostly in relief, posting a 5.32 ERA. He played 1977 between rookie league Medicine Hat and single-A Modesto, his ERA topped 5. Moore moved to starter full time in 1978 In his first six, sometimes wild, professional seasons, Moore never posted an ERA under 5. The best of Moore's early runs came in 18 appearances with Modesto in 1980, posting a 4.62 ERA. Helping him was an August outing where Moore gave up only one hit against Lodi and struck out 11. A five-game run at AA West Haven pushed his ERA on the year over 5. Despite his wildness, by May 1981, Athletics Manager Billy Martin called Moore "the best arm in the Oakland organization," according to The Bee. That year, Moore went 9-15 with a 5.12 ERA. He returned to Modesto in 1982 for his fifth run with the team. Upon his return, The Bee called Moore "he of the smoking fastball and uncertain control." It was his last trip to Modesto. Switched to relieving, Moore posted a 0.64 ERA in 14 innings of work. He also played at AA West Haven that year, his ERA returning to 5.89. In 1983, Moore played most of the year back at AA, at Glens Falls with the White Sox. He got his first taste of AAA in 1984, playing at Phoenix with the Giants. He returned to Arizona for 1985, posting a 3.50 ERA in 50 outings. He also lost 10 days and $50 with pine tar on his glove. He made his major league debut Sept. 11. In a total of 11 games with San Francisco, Moore gave up six earned runs in 16.2 innings of work. He also struck out 10 and walked 10. Moore struck out two and gave up one earned run in a Sept. 15 outing. Going into spring training 1986, Moore was looked at for a Giants roster spot, and even as a possible starter. But Moore never made it back that year or ever. 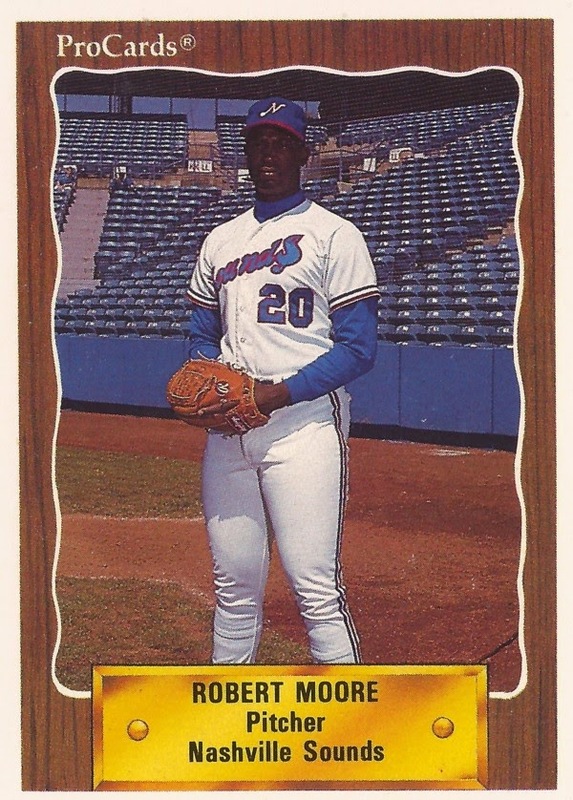 Moore played that season back at Phoenix and later with the Rangers at AAA Oklahoma City. He got a look with the Tigers system in 1987. He returned for 33 outings in 1990 with the Reds and Angels systems and then nine games in independent ball in 1995, ending his career. Moore passed away in April 2015 at the age of 56.